Our Tavarua Bamboo Roller Shades are made from sustainable bamboo that is both green earth-friendly and biodegradable. 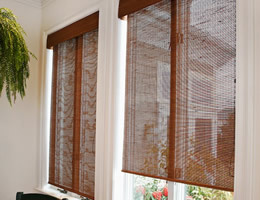 Made from real bamboo woven into sunscreen patterns, these natural woven wood roll up blinds offer the functionality of a solar screen roller shade with the style and elegance of a bamboo shade. The Tavarua sunscreen roller shades are available in three different bamboo styles, each offering a different openness factor and a wide assortment of colors and stains. Choose from our standard bamboo sun shades with a visible roll or upgrade with a matching bamboo valance to hide the roll up blind. The blinds are great exactly what we wanted! The blinds are great exactly what we wanted! The box they were shipped in though was crap, the blinds were practically falling out by the time we got them. Luckily they weren't damaged. The roller blind is mounted to a wood headboard with a matching valance made from the same woven wood material. For outside mount blinds, a separate woven wood piece is attached to the sides of the headboard.